Ivan’s Inner Circle is addressing both of these pain points because I will be your mentor. I will teach everything I have learned over the past 30+ years in networking and referral generation, and our technology partner at Synduit will become the only marketing software you need to build and implement your marketing plan for the entire year. I have not been this excited in years because the impact that all of us will produce together will be seismic in the world, and it will also take your franchise to the next level while supporting all of your members as well. The more I think about this launch, the more I realize how vital this program is to the success of small business owners and franchisers. Networking, referral generation, and marketing have become somewhat of a lost art and nearly every marketing software that I have ever seen is too complicated for the everyday user. 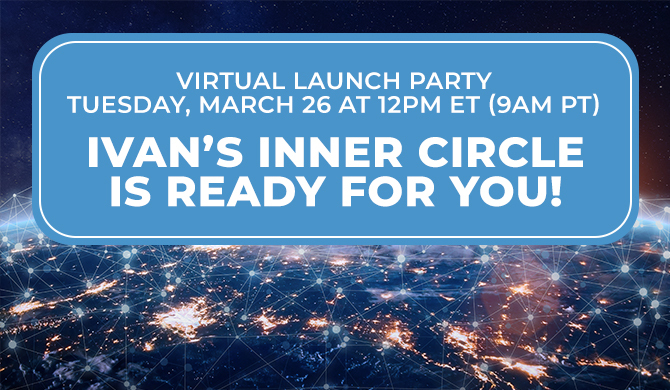 I am ready to share Ivan’s Inner Circle with you and anyone else you decide to invite during our official unveiling tomorrow – Tuesday, March 26 at 12 pm ET (9 am PT). Networking, referral generation, and emotional intelligence still aren’t taught in colleges and universities and nearly every marketing software system that I have ever seen is too complicated for the everyday user. For the past decade I have been thinking about building an environment where I could easily share the top lessons and skills I have acquired on networking, referral marketing, time management, and scaling a company with a select inner circle. I am pleased to say that I found the perfect partner to make these lessons an absolute game-changer for business people. I am really excited, because after 10-years of contemplating this idea, my friends at Synduit have developed a program they call “Ivan’s Inner Circle” which will officially launch on Tuesday, March 26 at 12 pm ET (9 am PT) during a FREE live webinar and Q&A. I will be your mentor. I will teach everything I have learned over the past 30+ years in networking and referral generation. Our technology partner will become the only marketing software you need to build and implement your marketing plan for the entire year. Allow me to mentor you on networking, referral generation, and marketing with the simplest marketing software for your business that you will ever find. The first webinar topic is: “Who’s in Your Network?” It is a spin on the content from Who’s in Your Room? but it is specifically aimed at BNI members and networking. Please invite other business people you know to this experience too. I have not been this excited in a long time, and I am eager for you to take part in this monumental launch of “Ivan’s Inner Circle”. Membership in a good networking group can be worth a considerable amount of money. Especially if you calculate the time you spend each month and the business value of your time. Do not waste your time. Make your time and efforts worthwhile. Don’t squander your opportunity by doing the wrong things in those meetings! Success in a networking group comes when the rest of the group members trust you enough to open up their best referrals to you. Until they’ve seen your work, you have to earn that trust by demonstrating your professionalism to them. 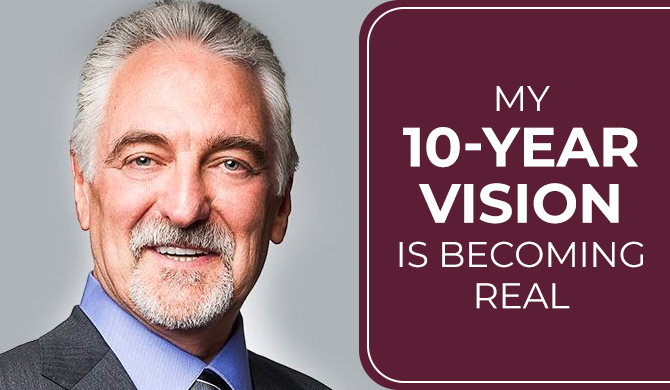 Since I founded BNI almost 25 years ago, I’ve seen how people have truly succeeded in networks–and I’ve seen how people have totally wasted their time in them. No. 10. Go ahead, air your grievances among your fellow networkers and guests; after all, they really want to hear about your complaints. No. 9. Wing it in your 60-second presentations; you’ve got plenty more chances anyway. No. 8. Use one-to-one meetings to talk about your networking group’s issues instead of learning a lot more about each other. No. 7. Focus your efforts on selling your services primarily to the members of the group. No. 6. Don’t rush following up on a member’s referral. They know where you are. No. 5. 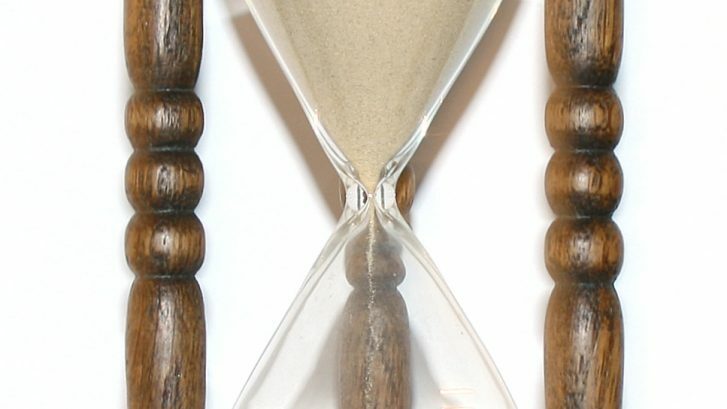 Use others’ 60-second presentation time to think about what referrals you can give that week. No. 4. Why invite your own guests? Just focus on those who show up. No. 3. Don’t worry if you get to the meeting late. No one will notice. No. 2. Be absent; it’s no big deal. You can just call in your referrals . . . right? And the No. 1 way to waste your time in networking groups . . .
No. 1. It’s OK, take that phone call or text message during a meeting. It won’t bother anyone, and it’s a real sign of professionalism that everyone admires. So there it is–The Top 10 Ways to Waste Your Time in a Networking Group! Print this out. Memorize it. Share it with your fellow networking members. Above all–avoid these mistakes! You’ll get a lot more out of your group and so will your fellow members. I’d love to hear some more ways that are big time wasters in a networking group. Please leave your comments below. Let’s add to this list. How Much Time Should You Spend Networking? People who say that networking played a role in their success spent an average of 6 1/2 hours a week networking and had half of their clients from their networking time. However, people who did not invest as much time networking also did not report as much reward. So, how much time should you spend networking? Therefore, spend about 8-10 hours per week networking and do the right things to build the relationships first when networking. The secret to getting more business through networking is. . . spending more time doing it! OK, well, it’s a little more complicated than that because you have to spend time doing the right things. However, devoting the necessary time is the starting point. So how much networking time (or NetTime) should you spend developing your personal network and what kind of results can you expect to see? Based on a survey that I helped to write and conduct of over 12,000 business professionals from every populated continent in the world, we finally have a definitive answer to those questions. The study found that people who said “networking played a role” in their success spent an average of 6.3 hours a week participating in networking activities. On the other hand, the majority of people who claimed that “networking did NOT play a role” in their success spent only 2 hours or less per week developing their network. Clearly, those people who spent very little time engaged in the process felt that networking was not an effective way to build their business. As with many other aspects of life, you clearly reap what you sow. It’s no wonder that the people who didn’t invest as much time also did not realize as much reward. This demonstrates the direct correlation between the amount of time you devote to the networking process and the degree of success that you will likely realize from it. You may be reading this article and thinking – OK, I now know that I need to be spending at least 6 ½ hours a week networking. Well, that’s true IF you want to be average (and what successful business person wants to be average)! If on the other hand, you’d like to be above average – you need to devote more time than that to the cause. The optimum amount of NetTime is more likely to be 8-10 hours a week if you want to be one of those people that are generating well over half their business from referrals. How much time do you spend networking each week? More? Less? and what percentage of business do you get from your networking efforts? Comment below. I’ve recently been having people ask me what a typical day looked like for me. The last person that asked me that questions caused me to ask a question to him in return. I asked him, why he was curious about? He replied, that he believed that “successful people had some routines that helped them achieve their success” and that’s why he was curious. I thanked him for including me in that list of people he thought were successful and told him I would write about it in an upcoming blog – and here we are. I believe my friend was correct – I too believe that successful people have routines that keep them focused and engaged. Routines are truly different for every successful person. What is the same is that they have a routine and they follow it. I can’t say that mine are that exciting but, they are mine and I like them. I should note that I travel a lot and when I’m traveling – the routine is much different. If I’m not traveling or attending a meeting, this is my normal routine. 30 minutes exercise in my home gym. Nothing crazy – walking, (sometimes outside – but often in the home gym watching the news), push-ups, crunches, stretching, simple bar weights. I try to eat breakfast like a king, lunch like a prince, and dinner like a pauper. (All the meals are generally organic and always healthy). I am a zealot about my schedule. Almost every hour is scheduled with something (including time to think, research, and/or write). Most importantly, I color code my calendar to know what kind of activities I have scheduled for the day. The things I love doing are all in various shades of green. (Red is bad, very bad. They are the things I don’t want to do but must do – yes, I have some of those too). My primary focus is writing, speaking, and doing interviews. On writing days, I only tackle urgent emails and then focus most of the day on writing related activities (research, writing, editing). Throughout the days I do scheduled media interviews (these are always a priority) or record videos for BNI regions. Around 7, I watch some movie or TV shows recorded on my DVR (yes, I have some guilty pleasures that I do NOT feel guilty about). If necessary, I go back into my home office around 8 – 9 pm to get some work done. Head to bed between 10 pm and 11 pm. Read the news or a book for up to an hour. Generally asleep by 11:30 pm. This is a normal day – I don’t always have those but when I’m home, this would be pretty normal. The routines I have that I think are worth noting include daily exercise, contemplation, healthy food, a specific routine for the work, guilty pleasures (wine, TV, or movies), and reading time each evening. And that my friends, is a day in the life of Ivan Misner. What surprises you or what would you like to add to your list? I was once walking along a very crowded city street in a large European city. People were walking in both directions with great purpose. One pedestrian, however, stood out from the rest in her green coat. She was walking a bit slower, with an uneven, irregular pace, and she had her head down. She wasn’t looking to the left or to the right. She wasn’t looking around. She wasn’t even looking at the sidewalk, or her feet. She was looking at her mobile phone. She was actually texting while walking on the crowded sidewalk, and she was on a direct trajectory to collide with me. “Look up. Look up. Look up,” I was softly repeating under my breath as she approached headlong towards me. She was about to run smack into me, and the sidewalk was so full that it was impossible to step out of her way without colliding with another person. I was on the verge of making my mantra, “Look up,” audible. At the very last moment before crashing into me, she looked up with a completely startled reaction. She was mentally not present, even though she was physically walking on that sidewalk with all of us. She was so distracted by her mobile phone that she was just going through the motions of walking somewhere. Learn how to ‘be here now.’ When you are working, work. Don’t spend time stressing over the things you are or are not doing in your personal time. When you are not working, don’t work! Don’t let the distractions of your professional pursuits keep you from being fully present in your personal life. It is very easy to allow ourselves to be so wrapped up and so caught up in something, that we cannot set it aside to change gears and focus on what is right in front of us. That is what the young lady pedestrian was doing before she pulled herself out of her virtual world to rejoin the events going on around her. It’s the same concept in the reverse, as well. When you are working hard on a project or accomplishing something demanding in your business, it is necessary to keep yourself focused on the task at hand. There are many things which can be a distraction. I have seen people become completely inept at the job at hand because they cannot be fully present due to some other pull on them from another area of their life. My mother had an approach to this dynamic that works well for me when I want to “be here now” and there are some distractions encroaching on my ability to do so. She used to say, “Put that in a jar and set it up on a shelf. When you are done, it will still be there, and you can take it down and get it out then.” Moms give the best advice, don’t they? So my mantra of “Look up. Look up. Look up,” can also be a way to keep yourself in the present and really begin to “be here now.” I think you’ll find that you navigate the paths of life, work, networks and family more profoundly and with greater success in all areas. People who say that networking played a role in their success spent an average of 6 1/2 hours a week networking and had half of their clients from their networking time. However, people who did not invest as much time networking also did not report as much reward. 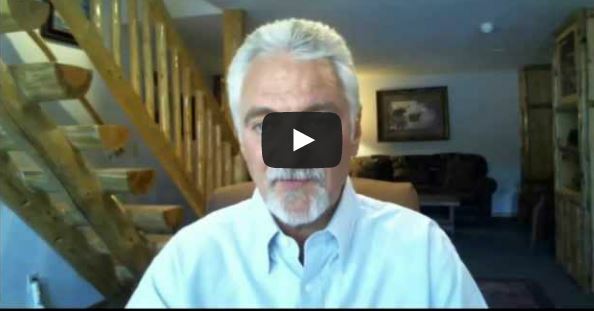 What does it take to start a home-based business and turn it into a global organization? I am sharing the many lessons I’ve learned to do just that. In 1985, I started a small business from my home in Southern California. 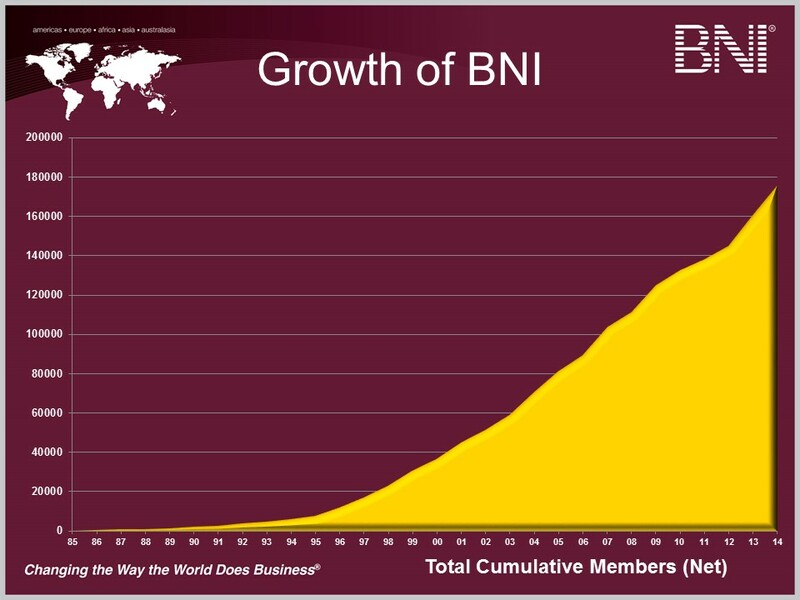 Today, BNI has ov er 7,400 locations in more than 65 countries around the world (see the member growth chart to the right). From business networking to management, scaling a business, and surrounding yourself with good people, I will be sharing with you the secrets for building a global brand. Go here and subscribe to my new Garage to Global Channel (part of the Entrepreneur Network) on YouTube: http://tinyurl.com/garagetoglobal. I have been doing video blogs for quite a few years now and a while back it occurred to me that some of the videos I’ve previously posted focus on timeless topics that deserve to be revisited and not buried way back in the video blog archive. For this reason, I decided to occasionally feature a “classic” video blog from my blog archive and today I am sharing the fifth one–”How to Invest Your Time and Money for the Highest Return.” In this video, I talk about how to invest time and money into your business in the way that will ultimately pay the highest return–education. Many businesses fail within their first three years of existence because they only pay lip service to education yet aren’t willing to invest the time, effort, and money into learning about how to continually grow and develop in order to achieve the business goals and the vision they outlined for themselves at the start. The fact is, people who immerse and engage in a culture of learning are much, much more successful than those who don’t. Watch the video now to learn about an action you can take this week that will help you measure whether or not you’re investing enough of your time and money into what will truly help your business earn more and achieve more. I’m quite interested in hearing your thoughts on this video, your comments about what you currently do in order to invest in educating yourself to build your business, and also your results from carrying out the action item I explain at the end of the video. Please leave your feedback regarding any or all of these things in the comment forum below. Thanks! 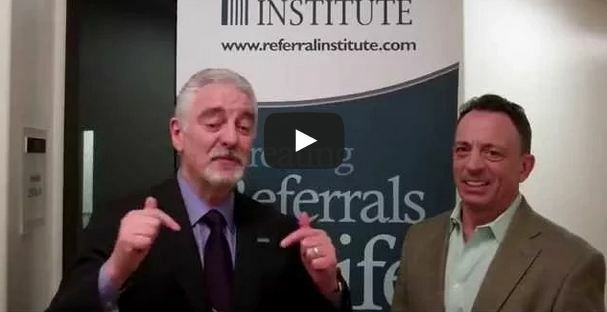 At a recent Referral Institute® Conference, I had the opportunity to talk with my good friend (and partner in the Referral Institute), Mike Macedonio, about a fantastic new (and completely FREE) service which is available to businesspeople and networkers across the globe. It’s called ‘More Money Mondays’ and by signing up for the service you get weekly referral marketing tips delivered to you via e-mail each Monday which will help you learn how to simultaneously build your business and make your work week shorter and more enjoyable. Watch the video now to get all the details on this exciting new service and CLICK HERE or go to www.MoreMoneyMondays.com to sign up for your FREE weekly referral marketing tips. If you’re already utilizing ‘More Money Mondays,’ I’d love to hear what you think of the service it provides–please leave your thoughts and feedback in the comment forum below. Thanks! 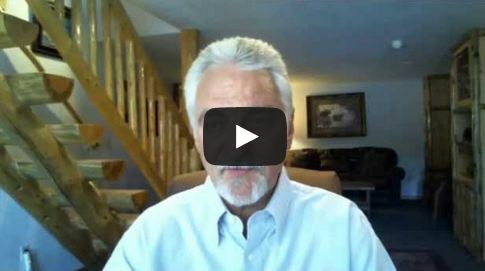 In this video, I talk about how to invest time and money into your business in the way that will ultimately pay the highest return–education. I’m quite interested in hearing your thoughts on this video, your comments about what you currently do in order to invest in educating yourself to build your business, and also your results from carrying out the action item I explain at the end of the video. Please leave your feedback regarding any or all of these things in the comment forum below. I woke up today feeling strongly inclined to share this video featuring my good friend Brian Tracy. Why? Well . . . It got me thinking about how unbelievably busy we can all get at times and how it can feel almost completely overwhelming–like we’re never going to be able to come up for air, so to speak. The fact is, time management is often one of the biggest challenges faced by business professionals across the globe and our ability to effectively manage our time can very easily be the single deciding factor between success and failure. That’s why I want to share this short video with you. In it, Brian explains a simple time management strategy that I really believe can be life changing for a lot of people. It doesn’t matter what kind of business you’re in, if you apply Brian’s strategy, I guarantee you will see an amazing boost in your productivity. I can’t promise you won’t still feel a little overwhelmed at times but I can say with confidence that using his strategy has at least helped me keep my sanity (which is something I’d like to hold onto for as long as possible, hard as it may seem sometimes 😉 ) and get more done than I previously imagined was possible. So, what do you think of Brian’s strategy? Do you have any of your own strategies for time management which you’ve found to be particularly effective? I’d love to hear from you so please leave your thoughts in the comment forum below. Thanks! 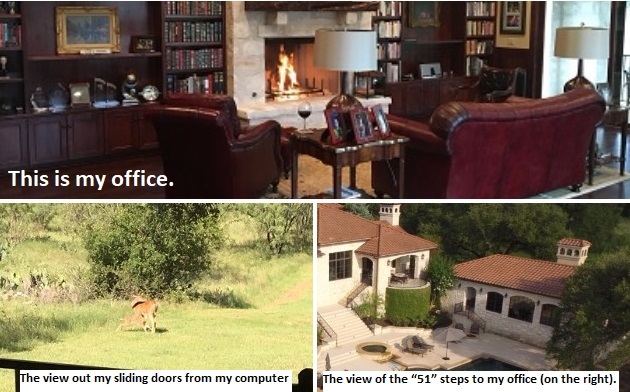 For more information on Brian Tracy, please visit: www.BrianTracy.com.